I looked at two different data series from the Bureau of Economic Analysis (bea.gov) to try to shed light on this. In both cases I took the extractive industries (mining, logging, and oil) as a share of some private sector measure, either earnings or wages. There is almost no change in the coal industry at this time, and logging is not an important sector in North Dakota, so the bulk of the change comes in the oil industry. As we will see the picture looks the same regardless of the specific measure. 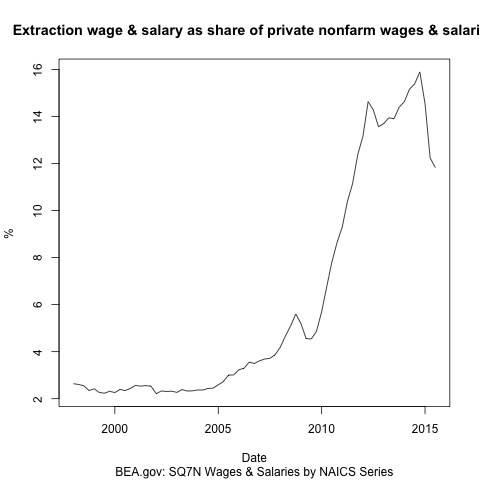 As a share of wages we see the rapid rise of the extractive sector as the oil industry takes off. We also see a peak and a decline, though it is still well above ten percent even in 2015Q3. 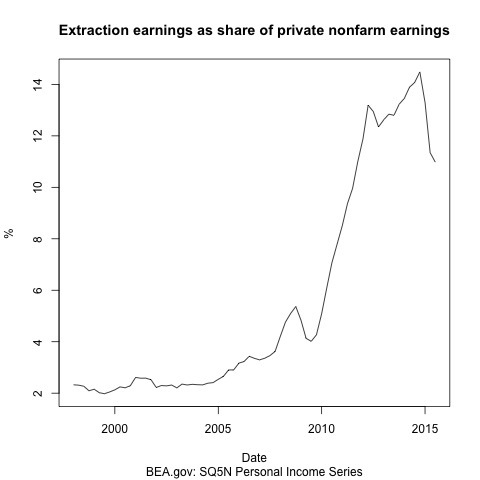 It is the same type of picture for the extractive industry earnings as a share of private nonfarm earnings. The difference here is the peak is a little less, but that is about it for serious distinctions. The big story here is that extractive industries go from about two percent of an earnings/wage measure to more than ten percent in about a ten-year time period. This is a major change within the state economy and is a clear reason for the questions I mentioned at the beginning of this posting. Extractive industries are right to assert increased importance, and possibly the most importance in the state, at least over the current time frame. That is not the topic for this post though. I asked yesterday if people would give up the highs to avoid lows though what we see right now is that, while certainly down from the recent highs, we are in no way back to the situation of a decade ago.